Girl Scout Cookies are a distinctly, happy, American phenomenon - one of those great traditions from everyone's youth you get excited about all over again each year. If your community is predisposed to the door-to-door Saleschild, first you order them. Then you wait. Sometimes a couple of months as the orders get processed. Then, finally, said child returns bearing gifts at your door. This happened to us last week. And it was a wondrous moment! But as it was late on a Friday afternoon, we thought why not enhance said tradition with something other than a glass of milk, that also further celebrates their All American-ness? 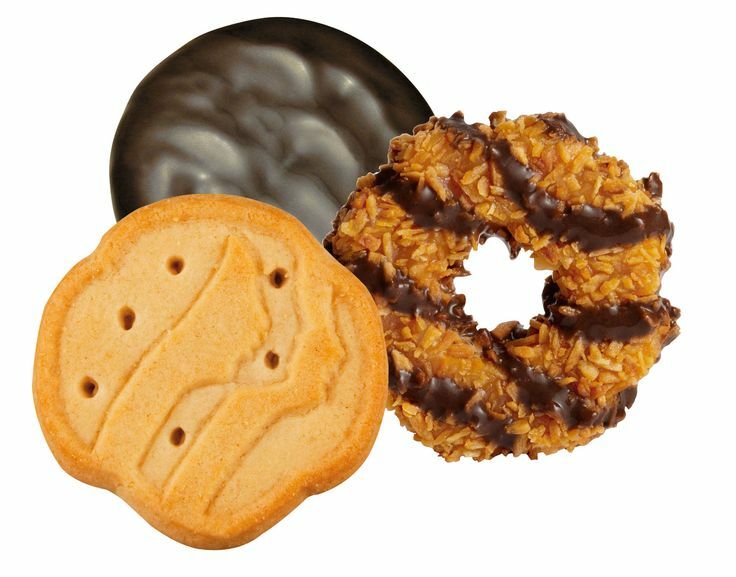 Today we offer findings from our taste-enhancing research, to further your own on-going enjoyment of this sacred tradition and this Classic line-up of Girl Scout Cookies. Cheers! shortbreads| Chardonnay. This grape is a no-brainer for these buttery cookies! Try a classic California style like Chateau St. Jean, or experiment with some great Chards coming out of lesser-known states, like Ravines Wine Cellars (Finger Lakes, NY) or Westport Rivers Winery (Cape Cod, MA). Domestic sparklers made from the Chardonnay grape are also a great match! J Vineyards (California) or Gruet (New Mexico) have Brut (dry) selections that would be decadent with these cookies. samoas| Roussanne orViognier. These cookies have evolved since the '80s, now incorporating caramel and coconut, but we didn't hold it against the Girl Scouts of America; some change is good! Here try something a little bit more “exotic” like the Stolpman Family Roussanne or White Knight Viognier. Whoop! peanut butter sandwiches| dry Gewürztraminer or dry Riesling. In the right hands and even more so when vinified dry, these grapes are a terrific match for these delightfully cloying, lingering, slightly salty cookies. The wines will meet their match, delivering a touch of unctuousness met with a wonderful, mouthwatering pop of acidity to cut through the ‘fat’ of these cookies. Seek out memorable, dry Gewürztraminer from either Gundlach Bundschu or Navarro Vineyards. Dry Riesling from Dr. Frank (New York) will do the trick, too. Thanksgiving Wine Selection - made easy! Thanksgiving Day is the ONLY holiday every single American celebrates. It is a day observed ladling up traditions at every opportunity; even if you're not doing what historically you have done, admit it - you're thinking or reminiscing about those things! But when it comes to wine selection there tends to be less tradition in play. For some that is the best part of the holiday - the vinous world is your playground! For others, what to serve or what to bring can overwhelm. We get it. As part of our "made easy" series, we are offering up a few suggestions for going home with a winner or two. If we can help with your specific feast or preferences, whether a consultation or shopping or both, don't hesitate to Click 2 Inquire. We relish overturning every rock (no minerality pun intended) to find stellar wines perfect for this time of year. And our holiday special is in play NOW through December 31, 2014! Noble white varietals are thought the darlings of Thanksgiving. The best hail from cooler climates, offer mesmerizing aromatics which lure you in, are lower in alcohol, a tiny bit "fleshy," yet deliver a crisp, mouthwatering brightness. We hang our hat on discovering earthy, lightER bodied reds - with backbone. Beware of selecting a wine that's too big, which will just weigh you down given all of the food before you. Remember, with such a big, intense meal with so many different parts and varied traditions, there are countless wines to choose from. When it come to Food & Wine Pairing, the endgame is BALANCE! Wondered where I've been? March was largely spent downtown or throughout Cambridge at various venues set up for trade folks to taste hundreds of wines, both those entirely new to market and also and equally important, newly released vintages of old friends. It was a more rigorous spring tasting season on "the circuit" (as we wine professionals call it) than last year, I hate to admit it. Meanwhile, I was preparing for my trip (now in motion...) to Spain, where I have been visiting what I call Cava Country, more formally known as Penedes, and also the Priorat. My travels began a couple of days ago with Marc Picon at Pares Balta, which proved more than I could have imagined, even knowing in advance that this is a fourth-generation run estate that has embraced organic viticulture since The Beginning, well before it was of interest or marketable to do so. They also operate in what is now a national Park. When I arrived, Marc, my congenial on-sight host and the estate’s Export Manager, explained that Pares Balta's main priority isn’t showcasing the “music” behind their work in the winery when they are introducing people to Pares Balta (and yes, they make many, many different wines); rather they are focused on the land. I smiled and nodded a bit when he said this, because if you’ve taken a trip to any winery worldwide, I’m sure you, too, have heard the owner, winemaker or staff talk about the importance of terroir. Not to undermine their work or the sincerity of these statements, but I have to say, Pares Balta really does relish the earth and the natural course of things in an extreme way (and the result is extremely tasty!). To explain better, Marc and I jumped in his SUV and began our “15 minute” journey up into the mountains where the Pares Balta vineyards are located, as I mentioned, now in a National Park. Yes, it is that serious. And yes, the ride was even more colorful than one of those Super Bowl SUV ads where you see trucks bouncing along easily over fallen logs, up cliffs and over boulders. If I could have taken a picture of it, I would have – but we were literally bouncing too much for me to capture the moment and video would have made any viewer nauseous. Our first “stop” up the vigorous terrain was to the Pares Balta beehives. A costly undertaking, no doubt, PB has a beekeeper on staff to further support cross-pollination of the vines of course, but not just so they flourish; rather, so that the entire community flourishes, imparting natural, enhanced flavors in the wine. For example, the rosemary bushes growing alongside the trail flower. This flavor profile is gently communicated to the vines as the bees carry out their natural work. Brilliant. Nature helping nature help us. Marc employed a terrific approach to best share both the Pares Balta way and what makes Penendes unique. We didn’t just bound up the mountain and look out the window. Instead, we stopped at various, specific vineyard sites to taste certain wines alongside the river in one case, and at the top of the mountain, in another. At each stop you could literally feel the change in climate, the quality of “freshness” in the air, the amount of (or lack of) wind, etc.. What makes Penendes so special was poignant and palpable: the varied terrain (a vivid mix of plots of clay literally across the path from plots of chalk) and microclimates. What was perhaps most compelling to me was the hands off/hands on approach PB employs. They fully embrace what nature delivers on its own, and yet they don’t hesitate to employ (or encourage nature along?) either. Case in point, they use pheromones at the edge of the vineyards site as a natural ‘turn off’ to butterflies (the wind carries the "off-putting" scent down the rows), encouraging them to go ‘play’ in someone else’s vineyards. It’s one way to avoid pesticides and let the fruit mature unhindered by pests. In addition, Marc enthusiastically designed a taste-off between two pairs of wines. The first was of two Garnacha’s from two different vineyard sites. Their flavors were of like family, but certainly of distinct breeding: 2008 Hisenda Miret, a more rugged, gamey beast that tamed willingy as it opened; and the 2008 Indigena, a fruit forward, approachable Garnacha with the flare of a rosey-cheeked flamenco dancer. The second taste-off was between two Tempranillos hailing from two different clones, one wine was made from the local Penendes grape Ull de Lebre, and the other from a Pares Balta project in a much farther region, Ribera del Duero. The Absis is a Tempranillo-based wine that delivered a surprising helping of stewed plumbs, golden raisin, orange rind, blackberry and brighter raspberry fruits, with intense herbs and purple flowers, while the Ribera wine showed more masculine muscle, wet soil, fine dried herbs and baker’s chocolate flavors. Long story short, I could have stayed all day! But appointments in the equally world-reknowned Priorat region beckoned…. If you prefer a cheese-tastic take on rissotto, go for a buttery Chardonnay from California. If you prefer a lighter, savory risotto, go for a more mineral-driven, Alsatian white like Chasellas or even Pinot Blanc. My brother in law makes a killer roast pumpkin - with all the root veggies and even tomatoes left to stew inside his prized Princess pumpkin. In this case, a fine option would be a Valpolicella from Italy. Savory, with stewed fruits and some nice structure, this wine's earthiness, fruit forward qualities and natural food-loving nature would be a treat. An earthy red from the Cote du Rhone would also work superbly. Go to the mothership of all things beef: Argentina! Go team Malbec. Any dessert made with pumpkin and seasoned with cinnamon and nutmeg will love a great off-dry white. Think Riesling or Gewurtztraminer. Either of these will complement the savory brown spices in the dessert, yet the richness of the food will be cut by the great acidity and low-alcohol nature of the wine. Which pumpkin dish is your favorite to make this time of year? Wines for fall: don't forget about white blends! Ever heard of Mueller Thurgau? Mueller is another one of the man-made varietals we've talked about lately. Back in the late 19th Century Dr. Thurgau created this hybrid varietal. His goal was to create a grape with the intensity of Riesling but with the ability to ripen earlier; he used Sylvaner to achieve the latter. He didn't quite get an A+ on his project, but he didn't do too badly either. Mueller wines are fruity, but low in acidity. They are medium sweet, too, and very smooth. This varietal makes up the greatest component of the JuneHog, coming in at 33% of the wine's juice. The next largest component of the JuneHog is Gewurtztraminer, or the "spicy white grape" that actually got its start in Traminer, Italy, but happens to have a German name. Go figure! Gewurtz is sweet, spicy, fruity, full-figured and has gorgeous floral aromas. (Trade "secret": Gewurtz is actually sweeter than Riesling!) This grape brings 22% of the juice to the JuneHog blend. The third largest component of this fun blend is Pinot Gris (21%). Recall from earlier posts Pinot Gris is the genetic mutant of Pinot Noir. Alsatian-style Pinot Gris is full bodied and offers ripe-fruit sweetness on the palate. These wines are down right lovely on their own, let alone in a blend! Pinot Blanc clocks in at 16% of the June Hog blend, which gets finished off with just a touch of Riesling (5%, if I've done the math right). I'm not sure how much time we've spent on Pinot Blanc together. But the thing to know is when winemakers don't oak it, or stir it on the lees or otherwise "interfere" with it, PB offers terrific apple and almond flavors. As such, it can be one of the softest yet lightest (read: high acid) white wines on offer. A treat on their own and perhaps even better in some blends. What's your favorite fall white (blend) this year?